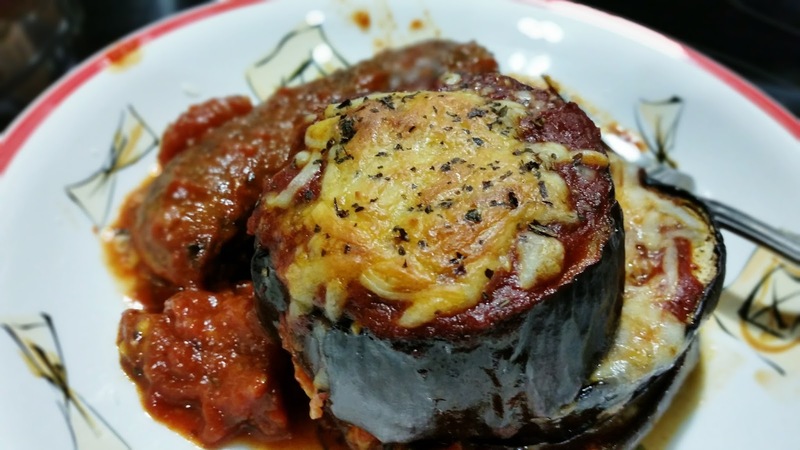 Baked Eggplant Parmigiana recipe, inspired by Mario Batali, is all about the eggplant. Thick, round stacks of eggplant encompass layers of Italian cheeses and traditional red sauce. Mario Batali is one of my favorite chefs, and he's a fellow ginger too. His rustic, authentic Italian style and combinations of flavors remind me of my grandmother, who was also a ginger. Born in Northern Italy, she cooked with fresh classic Italian spice combinations such as lemon and mint, or butter, garlic, and nutmeg. These are unlike the popular Italian American flavors many are accustomed. I'm salivating at the mere thought of her cooking. On to the eggplant! 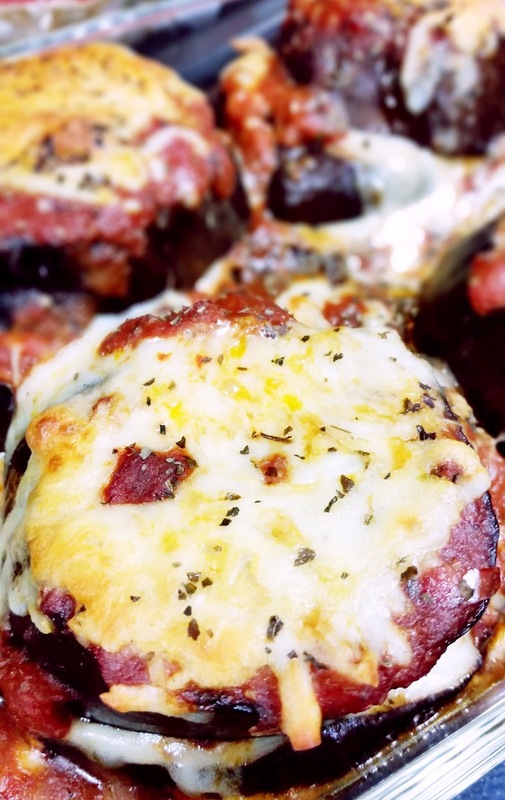 Stacked and filled with cheese, this is by far, my favorite eggplant parmigiana recipe. Not being breaded and fried allows the eggplant flavor to be prominent, the element that makes this my favorite. I’ve prepared this eggplant per the original recipe, with traditional mozzarella, fresh mozzarella, combinations of both, with and without ricotta cheese, and substituted Romano and Asiago cheese for Parmesan. Use your favorite Italian cheese combinations, as this is a versatile recipe. Who knows maybe this will become your favorite too! Oil a baking sheet with extra-virgin olive oil. Slice each eggplant into 6 pieces about 1 to 1 1/2 inches thick. Place on the oiled sheet and turn slices over to collect just a bit of oil on both sides of the eggplant slices. Lightly season each slice with salt and pepper. Bake the eggplant at 450 until the slices begin turning brown on top, about 12-15 minutes. Remove the pan from the oven and place the slices on a plate to cool. Lower oven temperature to 350. In an 8 by 12-inch size pan or baking dish, place the 4 largest eggplant slice evenly spaced apart. Over each eggplant slice, spread a thin layer of ricotta cheese, then 1/4 cup of tomato sauce and a sprinkle of basil. Next, place a slice of fresh or about 1/4 cup of shredded mozzarella over each eggplant and sprinkle with 1 teaspoon grated Parmesan. Place the smaller slices of eggplant over each of the disks and repeat the layerings again until all the ingredients are used. Bake uncovered until the cheese melts and the tops turn light brown, about 20 minutes. “In a 3-quart saucepan, heat the olive oil over medium heat. Add the onion and garlic and cook until soft and light golden brown, about 8 to 10 minutes. Add the thyme and carrot and cook 5 minutes more, until the carrot is quite soft. Add the tomatoes and juice and bring to a boil, stirring often. Lower the heat and simmer for 30 minutes until as thick as hot cereal. Season with salt and serve. This sauce holds 1 week in the refrigerator or up to 6 months in the freezer. Well this looks amazing. I love aubergine parmigiana!